Jill Weber is a middle school teacher in Cheney, Kansas and former Gilder Lehrman Kansas History Teacher of the Year. One thing I love about the teaching profession is that we are always constantly learning, growing, trying new things . . . all in the process of becoming better. This is true whether it’s your first year and you’re improving from the first month of school to the second. And it’s true if you’re a veteran teacher who decides to try something different to “shake things up.” There is always an opportunity to learn and improve. One thing I am learning more and more as I keep going is how important it is to have clear expectations. Now, it’s not that I didn’t know that I needed that when I started but I keep learning that what I think is “clear” doesn’t necessarily translate that way to my 7th and 8th grade students. I find that they ALWAYS do better when I am as simply specific as possible with my expectations. Don’t let that fool you. I didn’t say I lower my expectations. I simplify my explanation of the expectations so that it is as clear as possible. I am constantly getting better at this. 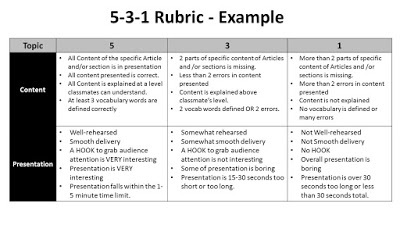 And one of my favorite examples is with my rubrics. 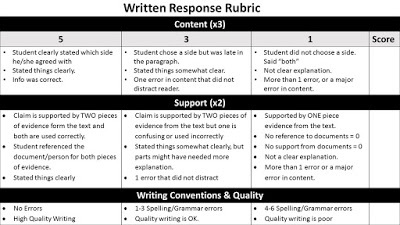 I am a FIRM believer in having rubrics to score students on. Nothing is more frustrating for a student to receive a score on a project or assignment and not have a clear picture as to why they were given that score. So when I’m making and using rubrics in my classroom, I’m always keeping in mind this #1 major rule . . .
As the teacher . . . the person setting the expectation . . . I will NOT take off points if it’s not listed on the rubric. I just don’t feel like it’s ethical for me to hand out a lower grade to a student for something that wasn’t mentioned in the expectations. This means at times, when I’m doing a brand new project or assignment, I have left off something that I should have graded on. Opps. My bad. I don’t just “make it up on the spot.” I write it down for something to add to the rubric next year. This year’s kids get a pass on that issue. Then after about five years of teaching, our curriculum director challenged me to paint a truer picture of what the students would earn by using a traditional 5-3-1 chart rubric. This would give clear expectations as to what a “5” score would get, what a “3” score and below. I liked it. It allowed me to give VERY DETAILED lists of what I expected and what the students needed to do to achieve a specific score. BUT . . . I discovered something. A problem that many teachers seem to face. The kids DON’T USE THE RUBRIC. If I’m lucky . . . they glance at it right before turning in the project. 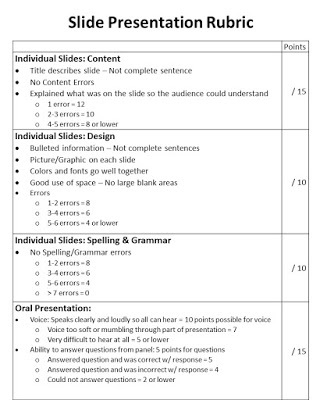 Only a handful of the students actually spend the time using the rubric to guide themselves through the project. I found that those detailed 5-3-1 charts were almost TOO DETAILED. Too detailed? How can something have too much detail. Well . . . if you’re 12-14 years old (or older or younger) you get overwhelmed with having to look at too much. 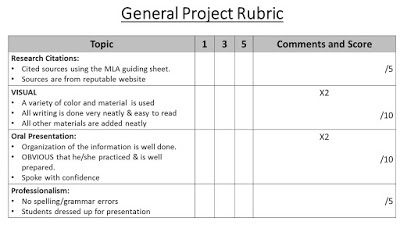 Sometimes creating the perfect rubric for a project takes a lot of research about rubrics and what you’re trying to achieve and what you want your students to achieve. These are just examples of some of my favorites. 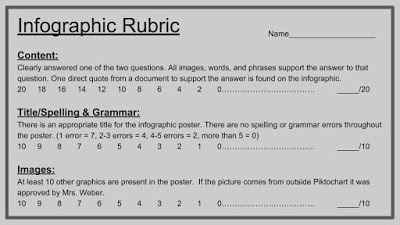 I still use all of these types of rubrics depending on the assignment or project. Don’t hesitate to steal anything from this blog post or contact me to talk more about it!